About a month ago, the first year med students at my school were in the midst of their finals week. As part of our school tradition, the second year med students (the big sibs) generally make or buy some snacks for them (the little sibs). “Perfect”, I thought, “another excuse to bake!” Except, the recipe I ended up going with doesn’t actually require any baking at all. Which I suppose is quite alright, as that meant I could make these without even having to haul all my baking supplies to the communal kitchen. 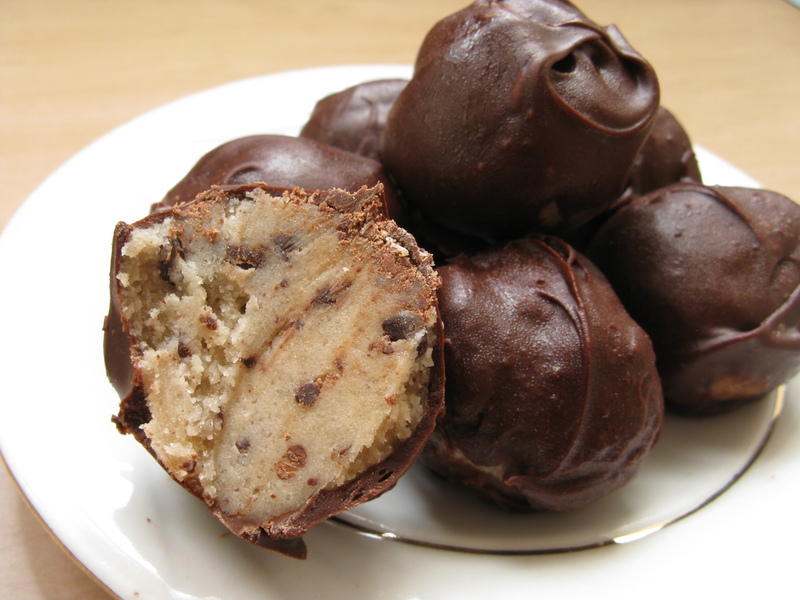 I saw a recipe on Love and Olive Oil for these cute little chocolate chip cookie dough truffles, which are basically little balls of raw cookie dough (without any raw eggs) enveloped in a shell of chocolate like their popular cousin the cake truffle. So simple in concept, and so devilishly indulgent! 2. Combine flour, baking soda, and salt. Then stir into butter mixture by hand until mixed. Stir in chopped dark chocolate chips. 3. Cover and chill dough in refrigerator for at least 1 hour. 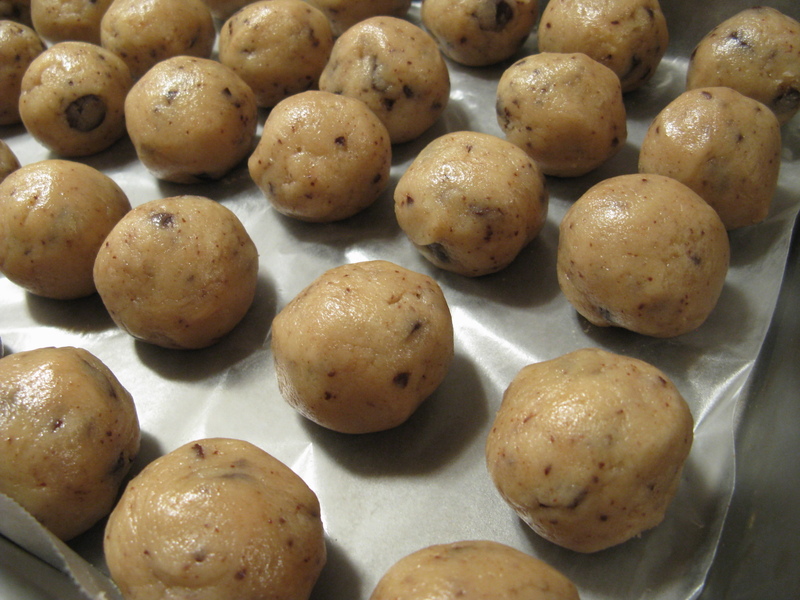 When dough is firm, form into 1-inch balls and place on wax paper-lined trays. Set in freezer for 30 minutes to chill thoroughly. 4. 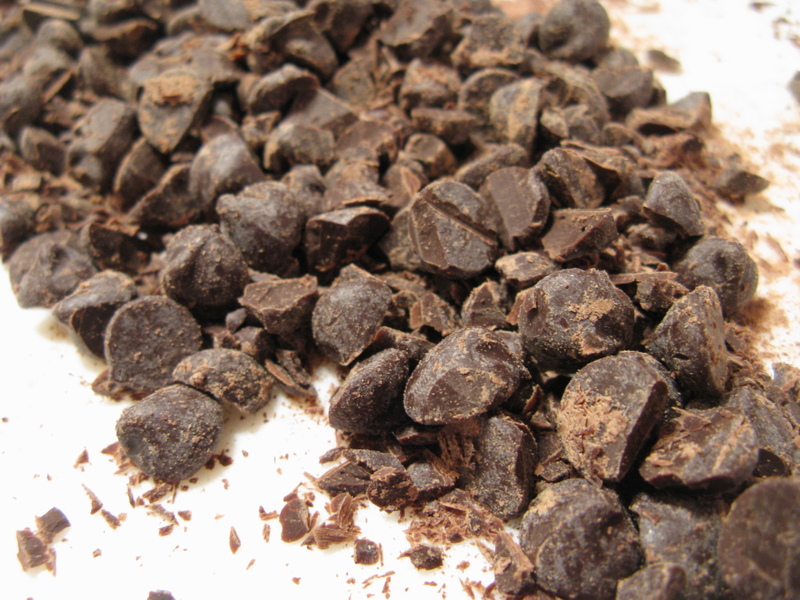 Melt 3/4 cup of semi-sweet chocolate chips at a time in a microwave safe dish, with a drizzle of vegetable oil (I like to melt my chips on 50% high power, for 1 and a half minutes, with additional 30 second heatings until chips melt when stirred). 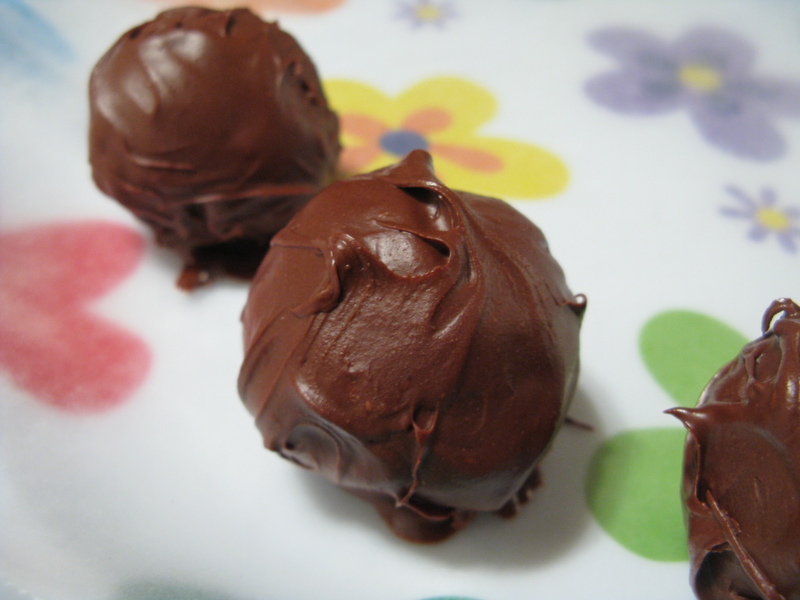 You can adjust the vegetable oil in the chocolate to achieve a smoother consistency for dipping. 5. 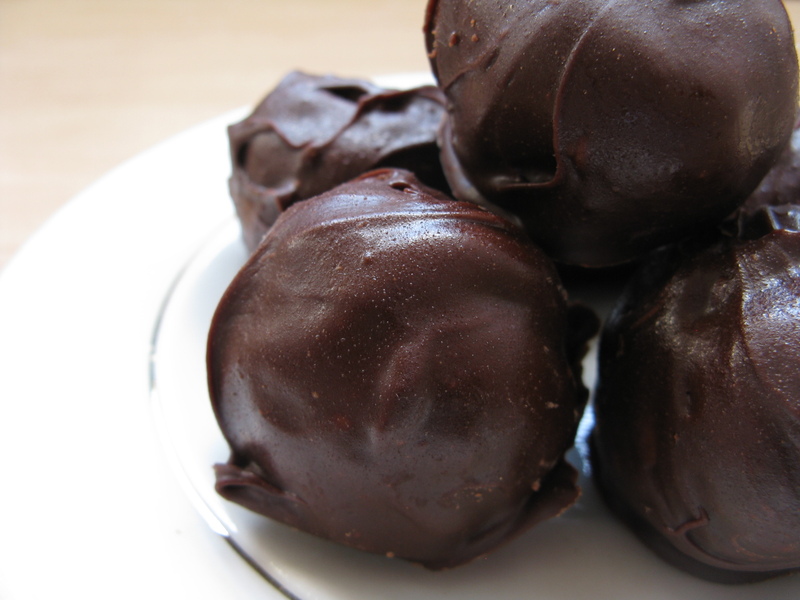 Dip truffles in chocolate and shake off excess before placing on wax paper to set. 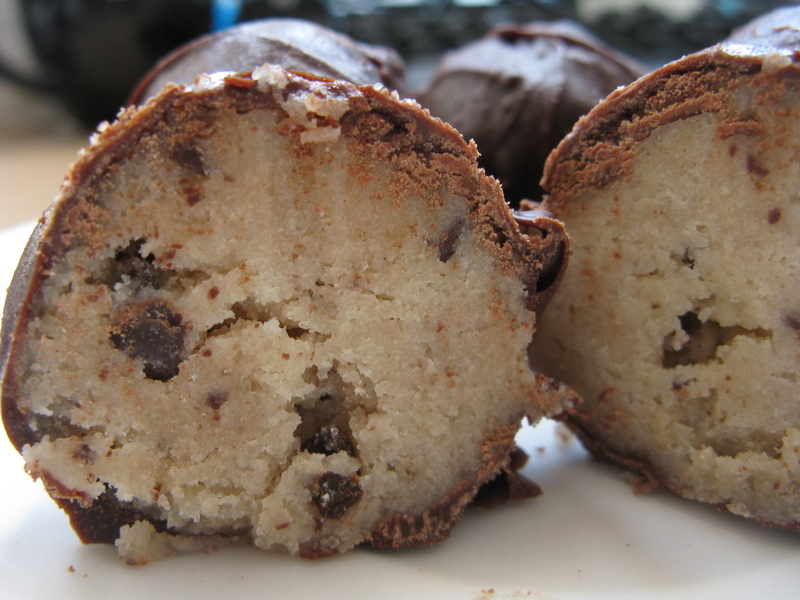 The finished truffles can be kept in the fridge, or stored in the freezer for later.